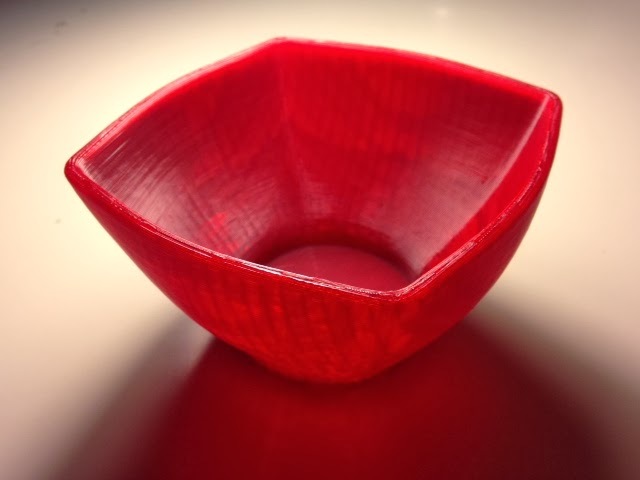 The Condiment Bowl designed by petergross3 in Thingiverse has such a beautiful shape, mixing squares and circles. We had been waiting to print it until our new translucent red filament arrived, and today is that day! Settings: MakerWare custom profile to get linear infill on the low PLA setting. UPDATE: A good news/bad news kind of situation... the bowl apparently looked good enough for someone to think it was a regular bowl, but this caused the bowl to end up in the dishwasher. Now it is distorted along one edge, and not so nice. New plan: put the bowl in the dishwasher repeatedly to see what happens!